Well, dear readers, this week I had grand plans of a entirely different project to show you, but was faced with unforeseen complications and could not do it in the time allotted. Therefore I moved on to plan B, and will save plan A for next week. ANYWAY, this week I figured I would explain how to make a bracelet out of an old t-shirt, super fun, super cute, you'll want to try it. Trust me. 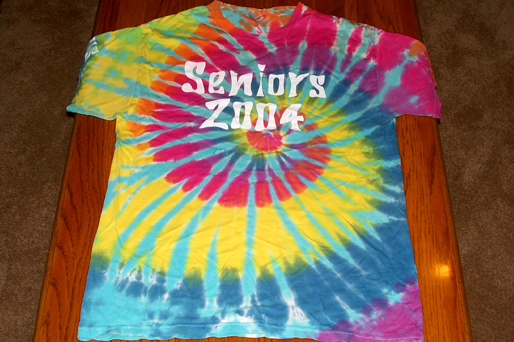 First you will need an old shirt, such as your awesome tie-dyed shirt from your senior year of high school. Turn the shirt inside out, then 1. Cut the shirt width-wise from sleeve to sleeve. 2. 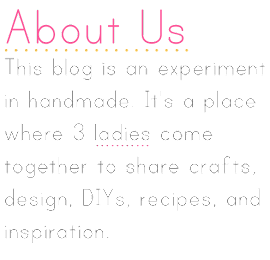 From the bottom portion that you just cut off, cut out a rectangular shape. 3. Cut the rectangle into one to three strips (note: I originally was going to do three strips, but it turned out chunkier than I wanted, so I ditched one strip and stuck with two. You can use as many strips as you'd like, the more you use the chunkier it will be) 4. 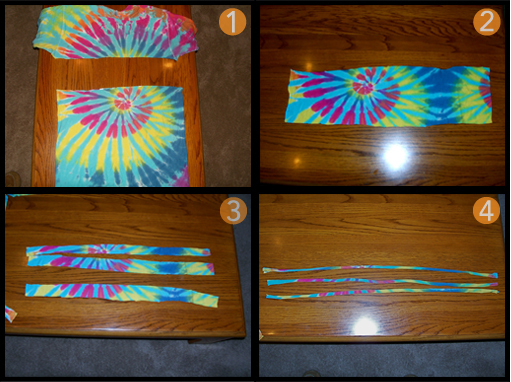 Pull each strip so that it rolls and becomes rope like...careful not to pull too hard though as the fabric will rip! 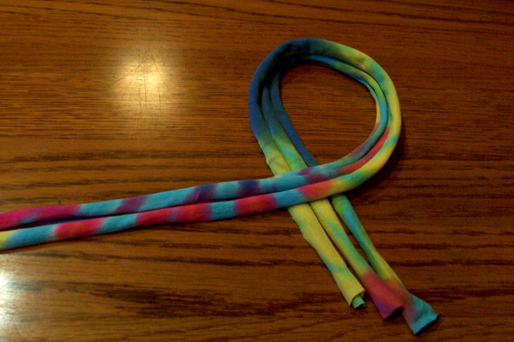 Next you will make your Josephine knot. 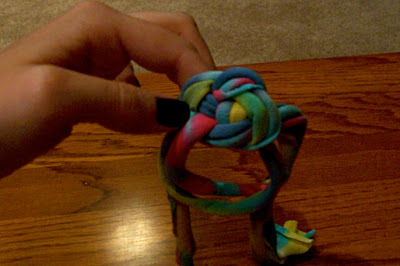 It is fairly easy to do, but extremely hard to explain, so I encourage you to go here to watch a video of how to make the knot (she explains the knot in particular about 6 minutes in). This is where I learned, and she explains it much better than I could. Yay! You did it, and it looks something like this! Right? Right. You're almost done! Just one last step! Figure out how big you need the bracelet to be to fit your wrist (this may involve cutting the middle loop to make it smaller) Cut out a small square from your remaining fabric. Lay the square flat and apply your fabric glue around the edges, but be sure to not go too crazy with it as it will soak through and be visible even after it dries. 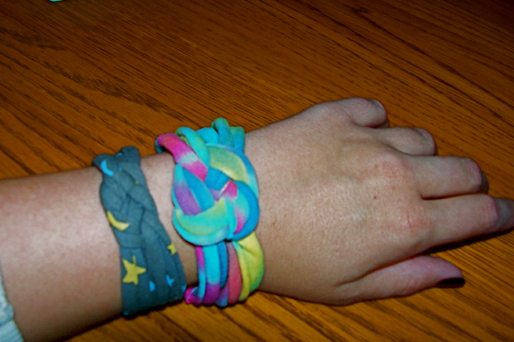 Let it sit for a second, then lay the ends of the bracelet on the swatch and wrap the swatch around the ends. Voila! You're done! 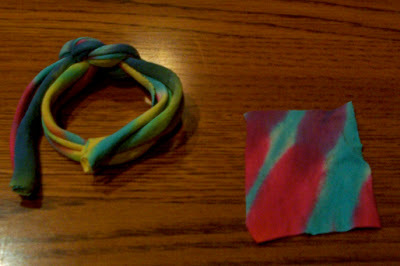 Pictured here is the one I made today, as well as a previous one I made. I think I will pull the knot a little tighter on the new one and redo the closure to make the whole thing a little less bulky, but all around a successful endeavor. So go make your own and share your creations with us! We'd love to see what you come up with!